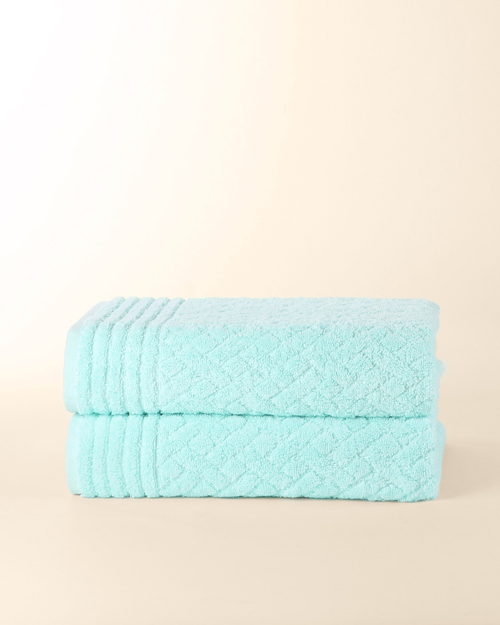 Super soft embroidered towels work hard to keep your skin feeling soft and dry. They also add a brushstroke of colour to your bathroom and add individual highlights of embroidered elegance that say a lot about who you are. But how do you tell a high-quality towel from a cheap and nasty one? Online and on the shelf they can both look so similar. Help is at hand! Trust our top tips and ensure you always choose deluxe towels that feel both indulgent and luxurious. Cotton fibres hold nearly 25 times their weight in water. Towels designed and priced for basic use are usually made of standard cotton. Soft and thick Egyptian collection towels have longer threads meaning more absorbent loops per inch. Always make sure you buy 100% cotton towels and choose the royal egyptian collection for added thickness, softness and durability. Check for thickness and a well-stitched hem. The denser the stitch the more absorbent the towel. A good hem reduces the possibility of fraying and ensures your towel has a longer life. Gsm simply means grams per square inch. A low gsm (300-400) means a thin, low quality towel. When a towel has a high gsm (500-750) it means superb absorbency, softness and quality. It’s that simple! The Towel Shop’s new Royal Egyptian Collection of hand towels, bath towels and bath sheets tick all the boxes. It features five stunning designs with beautiful embroidered patterns stitched specially to bring gentle style to your bathroom. You can select from the silky feel of the faster drying Kelly Swirl 500gsm towel, soft and thick 600gsm towels, and the super-luxurious Samrot Chequered towels at 750gsm. All the towels are 100% cotton and machine washable at 40°C. The Kelly Swirl hand and bath towels come in camel and cream. They are sleeker than the other towels in the range providing for faster drying, but still come in at the luxury end of the market with a weight of 500gsm. 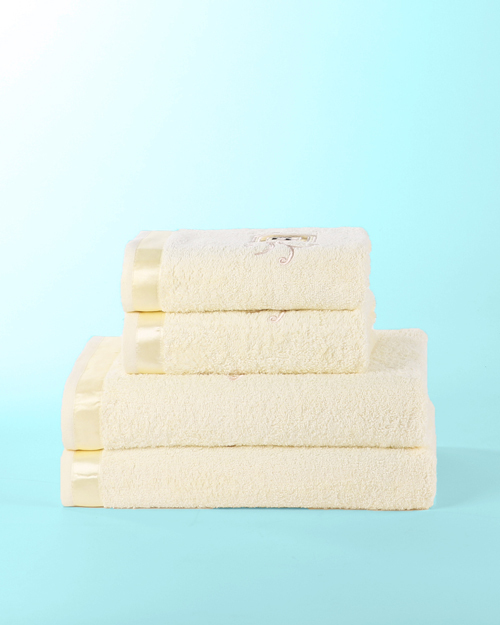 This plush bath towel is available in duck egg blue, camel and cream and designed to pamper! It smothers you in super absorbent softness offering a staggering 750gsm. 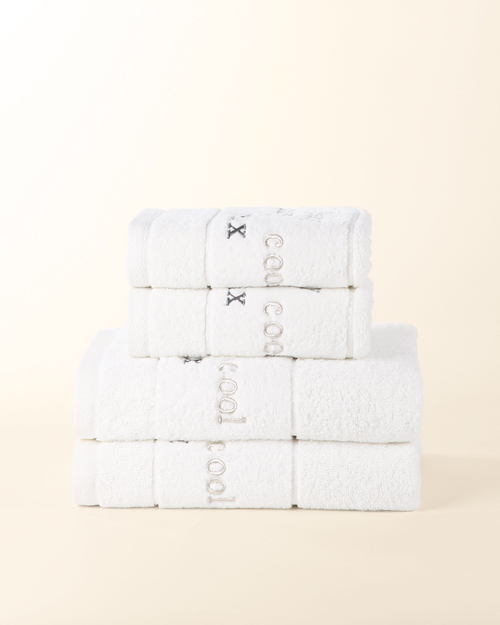 A stylish range of fluffy white hand and bath towels, and bath sheets, featuring embroidered calming words to help you relax, all at 600gsm and offering very high durability. Super absorbent 600gsm Frame design white bath sheets featuring beautifully and subtly embroidered silken logos. Available in camel and grey, Rome 600gsm bath towels display an embroidered calligraphic design to bring a touch of class to the bathroom. The Towel Shop embroidered towels should always be washed at 40°C to stay looking fresh wash after wash and avoid puckering around the stitching. If your towels are coloured, select a washing liquid designed for coloured fabrics and avoid bleaching agents. Remember that fabric conditioner coats the cotton loops of towels and reduces their absorbency, so avoid it. Tumble dryers are great for plumping up towels and giving them additional softness, but make sure that you do not overload your dryer as this can cause wear and tear. Our fish embroidered beach towels are 100% cotton and sold in packs. There are two different packs available one for adults and one for kids. The adult beach towels are 450 GSM and the kids beach towels are 420 GSM, they are absorbent, soft and quick drying. We offer a bespoke embroidery service on the towels we sell, if you are interested please Contact our customer services team and they will be happy to assist you. Embroidery really does add a touch of magic to fabrics and textiles, it can bring something special to your towel collection. 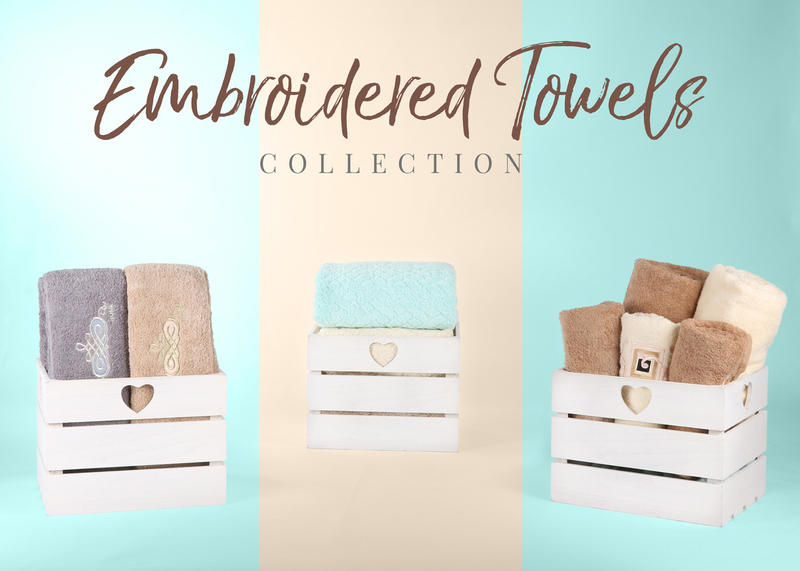 While our range of luxury plain towels lends itself to a classic yet cosy and homely feel, the embroidered towels has a delicate appeal that is really something. A great addition to your home or a nice gift idea, embroidered towels have a timeless quality and an historical feel. That makes sense – embroidery has been part of many different cultures for centuries. It is considered an art form. The earliest evidence of embroidery comes from China in around the 5th century BC. It has also been a big part of Turkish and Middle Eastern culture and continues to be today with exquisite crafts being famous in the region. Ancient civilizations of South and Central Americas used intricate embroidery in their clothing, while in medieval England embroidery was a way of making records – the most famous example being the Bayeux tapestry. Today, embroidery is a hobby many people continue purely for fun – to express themselves in an artistic way. Such admirable creativity can be combined with the art of interior design and home making to create an environment that is a pleasure to be around. Choose The Towel Shop for high quality embroidered towels and free UK mainland delivery. If you find the identical product cheaper elsewhere, The Towel Shop will match the price or meet 100% of the difference without any quibbles. And, if you are not completely happy with your towels, you can return all unwanted item(s) within 365 days provided they are still in their original purchase condition. The Towel Shop is a Google Certified Shop, which means you know that you'll receive your goods on time and get great customer service. Our unbeatable prices, quality, delivery and service are the reason customers have rated us as excellent on the website Trustpilot. You are safe with us.